My favorite reverb plugin for Audacity is one called Ambience by Smart Electronix. 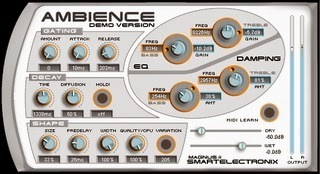 Ambience sounds great, comes with a great selection of presets and can be downloaded for free Here. Not the reverb, but the controls. Can't select and type in a number, can't easily turn the "knobs" with trackpad/click. What's the point in trying to build software with interfaces looking like hardware? All that's needed is setting some friggin' values. It doesn't need to look "pretty". I don't find the knobs so bad (ok, I didn't try it with touch but with mouse). Just click on the knob and hold mouse button, then move mouse straight down/up or left/right to turn it. Don't try to circle round the knob ..